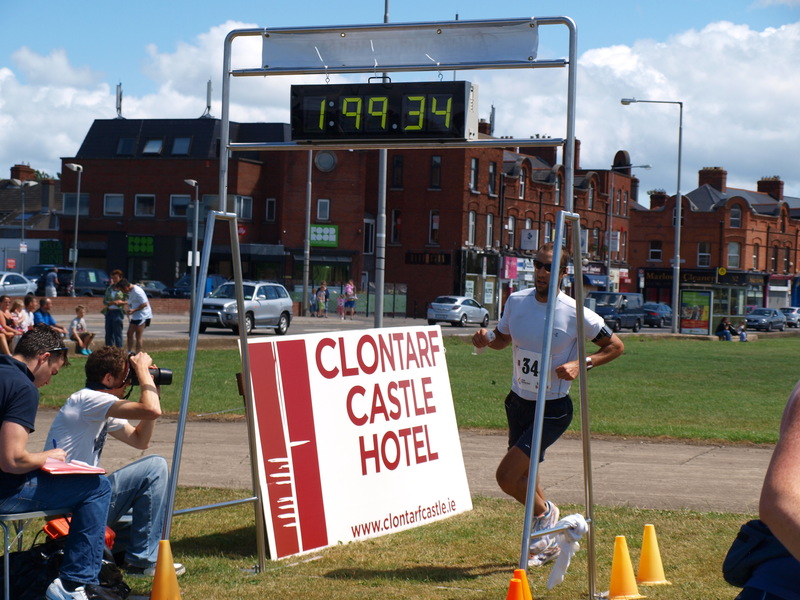 This morning’s half-marathon outside of Dublin (Clontarf) had a delayed start and included full warm sun, then cold rain, back to sun, with sustained winds in excess of 30 miles an hour throughout. Though flat, the out-and-back harborside course had a total of about 3 miles on a sandy beach (particularly interesting given the wind), two crossings of a wooden-planked bridge, a bit of auto traffic, and multiple 90 degree turns onto changing terrain. Crazy running and I’m quite pleased with a 1:44 given the conditions. The effort felt PR-worthy and some sub-7 minute miles (when we had a bit of shelter from the wind) felt suprisingly natural. I think Id have been a solid 10 minutes faster today on a similar course, minus the sand and wind. Three talented veteran runners were among those who I overheard afterwards saying it was the toughest conditions they’ve experienced in a race. I’m awaiting final posted results but hoping I placed in the top 50 or so out of the field of probably ~600. Jessica Carter That sounds like quite the adventure! I can imagine that the run was quite gorgeous even with the crazy weather. The only thing I can’t understand is the wooden plank bridge – how many of you crossed that thing at once? and was it swaying? That part sounds a little scary.